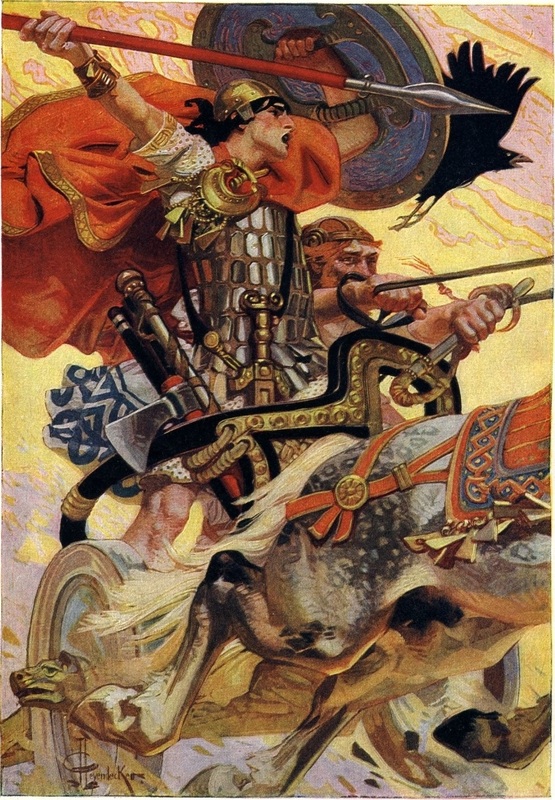 Mongán son of Fiachna is one of my favourite characters from early Irish literature simply because he is so damned mysterious. He seems to stand on the threshold between pre-Christian and Christian, prehistory and history. So many of his stories are underpinned by historical facts, real people and real events, yet they are wrapped up in so much that is purely mythic. The stories and poems, the real annalistic entries, make his legend ever fascinating. He is a wonder, is he not? Another king with annalistic provenance who intrigues me is Guaire Aidne mac Colmáin of Connacht. He again spans a period during the christianisation process where the glove is made to fit the hand, and is associated with a Chief Ollam by the name of Seanchán mac Cuairfheartaigh (‘Senchán Torpéist’) who makes a number of appearances in legends spanning the same period: These deal with bardic issues, particularly the Tain (in ‘Tromdámh Guaire’) and the tale of ‘Prull’ in Sanas Cormaic. Senchán actually gets a bit of a rough deal in both tales, and seems to be satirised due to his keeping one foot in the pagan world. Guaire seems to be presented in literature as a model Christian king, and I often think he is the original identity of the Manx hero-king ‘Gorree’ or ‘Orry’, usually interpreted from an eastern perspective as Godred Crovan of the 11thC! Manx ‘Fenian’ legends have Orry as a character with Oisín etc. Compared to Guaire, Mongán mac Fiachna has a much wilder set of stories told about his abilities and doesn’t come across as ‘christian’ – even his name seems to be a reference to his magical father. However, those links to Ellan Vannin, Manannán, Finn and the various legendary poets intrigue me even more… I think those famous scribblers at Clonard, Clonmacnoise, Cashel and Iona etc between the 6th and 9th centuries had their work cut out creating some serious legendary pseudo-history in order to try and reconcile the old and the new. In fact, I don’t think the Gael even had ‘high kings’ as an idea until the Romans planted the seed of it among the Britons as a means of federalising them: The continental christian hegemonies down to our current day simply continued this model, pushing it evangelically towards our ‘untamed’ northern and western shores in successive waves over the centuries. Yes, Mongán has something of the “Arthur” about him. Not quite historical, not quite mythical. The references to Fionn are fascinating because they are so damned allusive. Then the tying in to the Eachtra Bhrain mac Feabhail. You get that Tolkienesque impression of untold stories in the background never to to be told. I agree, Guaire Aidhne is another one of those liminal 6th and 7th century figures that intrigues. Another interesting reference to Mongan and Manann(an) can be found in the (? )Early-Modern Scots Gaelic poem ‘Réalta an chruinne Caitir Fhíona’ in which the poet invokes a host of Christian and pagan characters: “… Ciarán Caoimhfhionn, Colam Cille, caomh an fhoireann, Pádraig, Martain, Mongan, Manann, Coman, Coireall…” – pretty fascinating, especially when you realise that ‘Caitir Fhiona’ is NOT ‘St Catherine of Alexandria’… The Gaelic language is pregnant with a million possibilities where modern scholars still stumble in their political quests for literal orthodoxy.